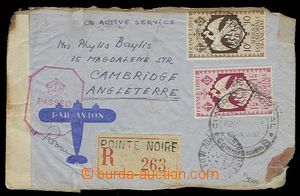 1943 AFRIQUE EQUATORIALE FRANCAISE Reg and airmail letter to England, with 1+10F, CDS Pointe Noire/ 7.JUIL 43 + postmark post. control AEF + censor English. postmark, open and sticked up, on reverse transit. Registered/ 16JY 43/ Lagos, Nigeria, double-line cancel. DAMAGED BY/ FIRE IN TRANSPORT, envelope from all sides ohořelá, letter inside, extraordinary.